My students completed an art project this fall based on the work of Paul Klee. I first shared a short biography on Klee's personal and professional life. The book was very inexpensive on Amazon or could likely be picked up at Powell's. After sharing the book I introduced the students to a specific piece of Klee's work, Castle and Sun. Students were then given 12 inch by 18 inch black construction paper as a background. I distributed a pile of 2 inch right triangles to each group of students (Huge thanks to my parent volunteer, Kara, for cutting hundreds of triangles!). 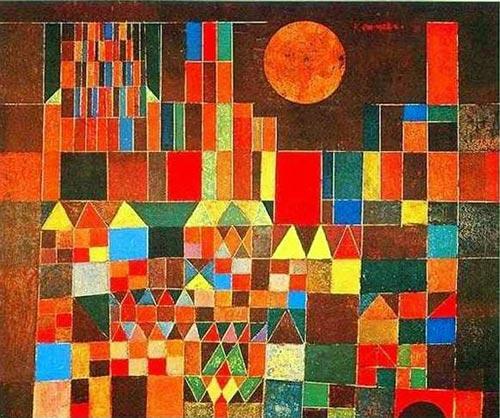 The triangles were in a variety of colors but mainly browns, oranges, and reds, as reflected in Klee's original work. Students created their imitation version of the painting by combining triangles into squares, mix and matching colors and shapes, and patterns. As students pieces were completed, I grading on neatness and imitation of the original painting. I created a sign identifying our goal for the project by punching multiple colors of letters with our Ellison paper punch. The letters are layered to incorporate more color, of course! With large items and limited board space, I used the hall as our art gallery!